Week four is in the books, another 50 hour week, with voluntary overtime. This week, they have called mandatory overtime for all shifts, as they are experiencing higher than expected volume for Halloween. On a typical day, we are both picking 800 – 1000 items per day. This week, at least 50% of the items were costumes or accessories. At the beginning of each shift, and after lunch, we have “stand up”, where everyone is required to do stretching, and the managers will update us on the volume of the orders. This week our manager stated 80% of all apparel that is ordered from Amazon is shipped out of our Fulfillment Center. It is no wonder that this place is bursting at the seams with apparel everywhere. Superman and Batman are running neck and neck in popularity this year, and Spiderman….what happened to you? I have not picked many Spiderman costumes. Anna is beating out Elsa, for top honors with the Disney Frozen costumes. Star Wars and Star Trek are very hot this year. And the Teenage Mutant Ninja Turtles continues to be very popular as well. Time is going fast for us, which is surprising. I remember our first year, it seemed to take a long time until our fourth week. Personally, I think you need to commit to at least four weeks, before deciding to quit. It seems everything seems to fall in place after the fourth week, and you realize “I can do this.” We have had 3 Camperforce people quit so far. One was due to a death in the family, another had a medical condition that made the job too difficult, and the other person said she just wanted to see what Amazon was like, but said it was more work than what she was interested in. She quit in the 2nd week. 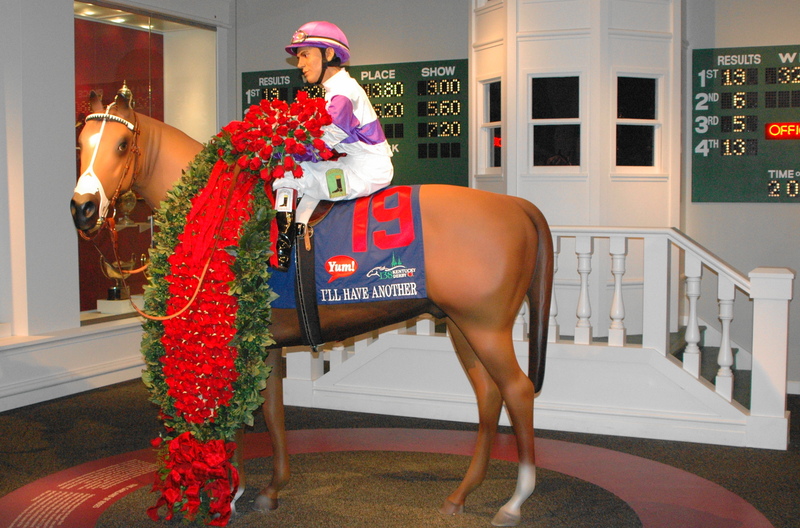 As with our last blog on Louisville Slugger, I am going back to 2012 when we visited Churchill Downs, and toured their excellent museum. Churchill Downs opened in 1875 thanks to the efforts of Meriwether Lewis Clark, Jr. the grandson of William Clark (of the famous Lewis and Clark explorers). 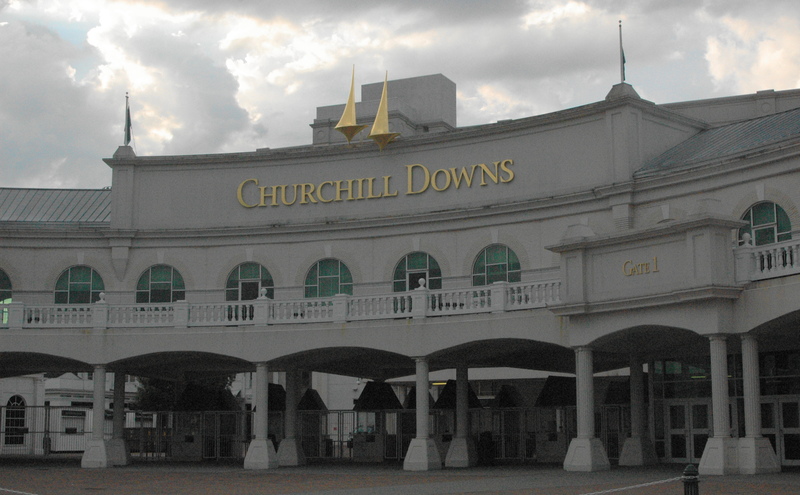 He leased the land from his uncles, Henry and John Churchill, which is where the name Churchill Downs came from. 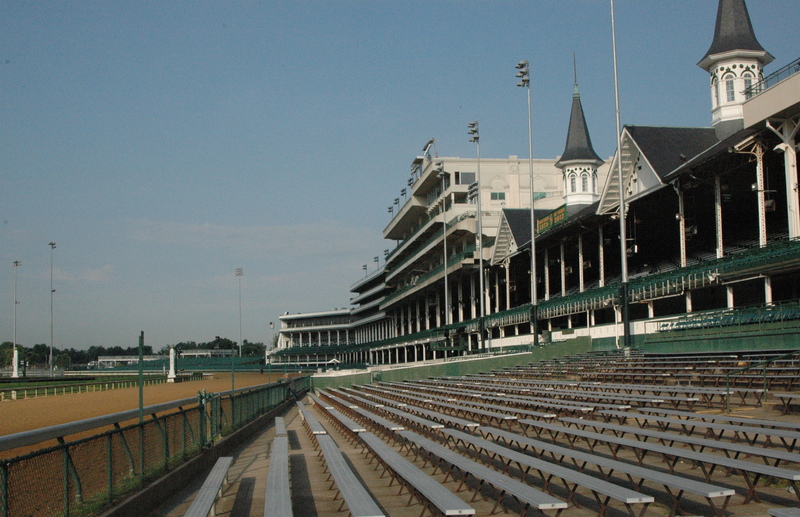 Twenty years later, the grandstand, with the famous twin spires, was completed. The finish line is the white post on the left side of the track on the photo below. 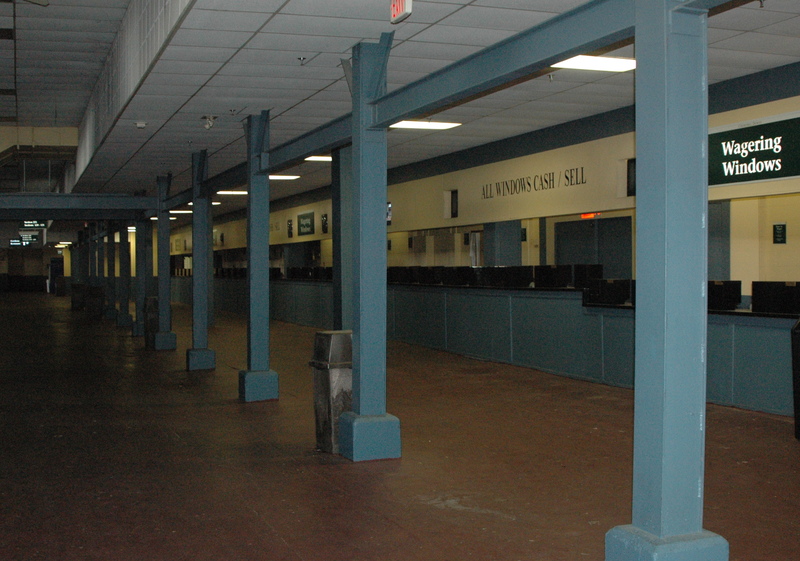 The age of the park shows when you walk around under the grandstands of the general seating area. 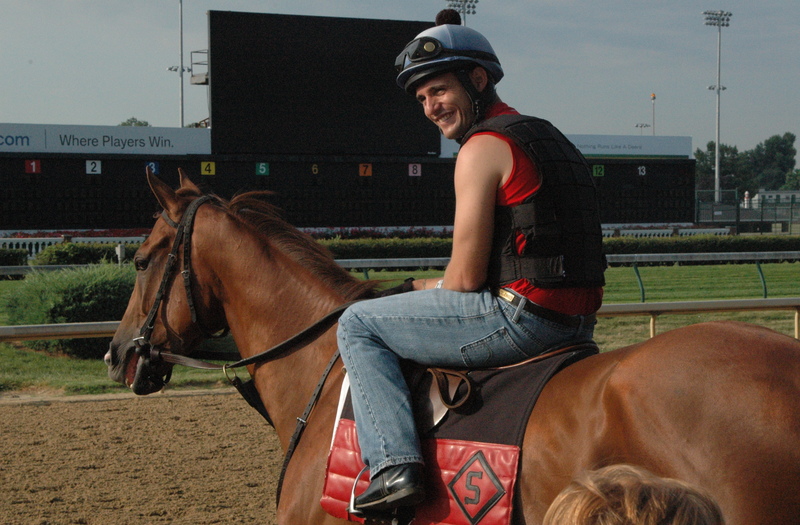 On the day of our visit, there were many trainers and jockeys out on the track with their horses. 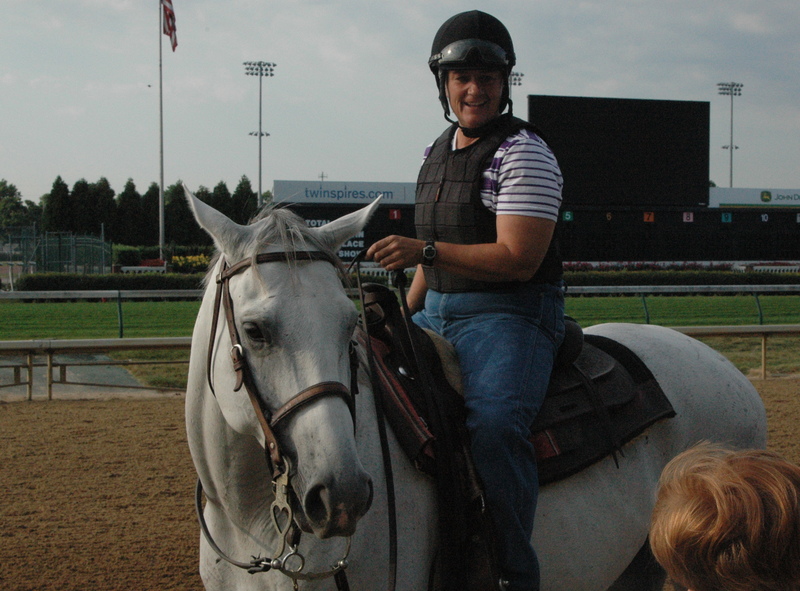 It is easy to distinguish a trainer from a jockey, as jockeys must meet specific weight requirements (no more than 126 pounds, with equipment for the Kentucky Derby). 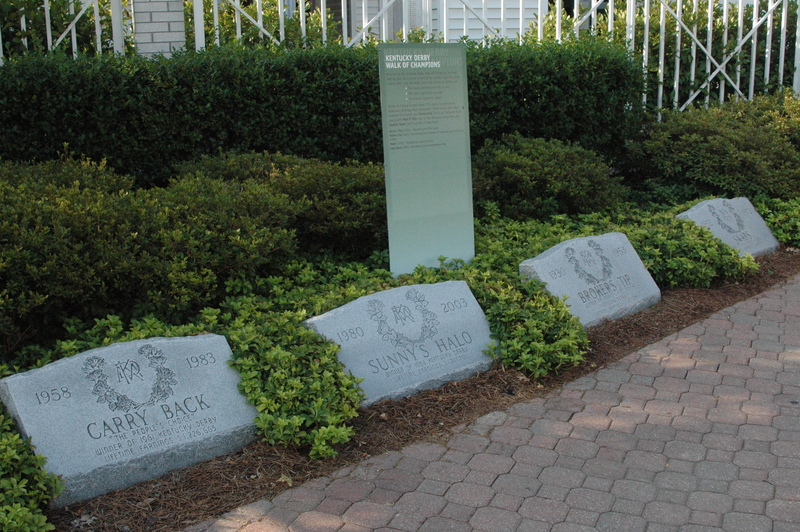 Churchill Downs has the Kentucky Derby Walk of Champions, where several past Derby winners are buried. Usually, when a horse dies, only the head, heart and hooves are buried. The head represents the will to win, the heart represents courage, and the hooves represent speed. There are exceptions when the entire horse is buried, usually it is for distinguished champions, such as Secretariat. 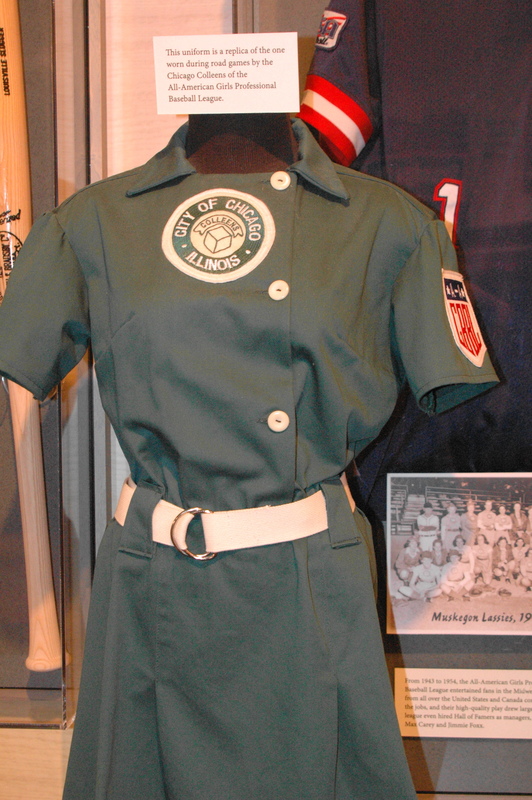 The museum has a wonderful display of various memorabilia. 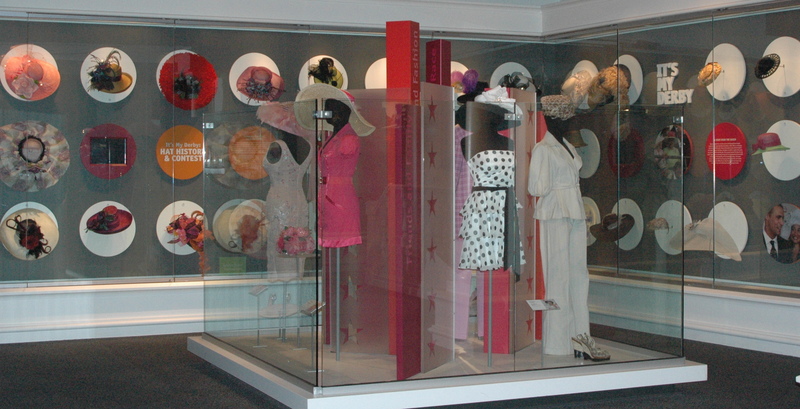 They have a large display on hats and outfits, donated from past patrons. 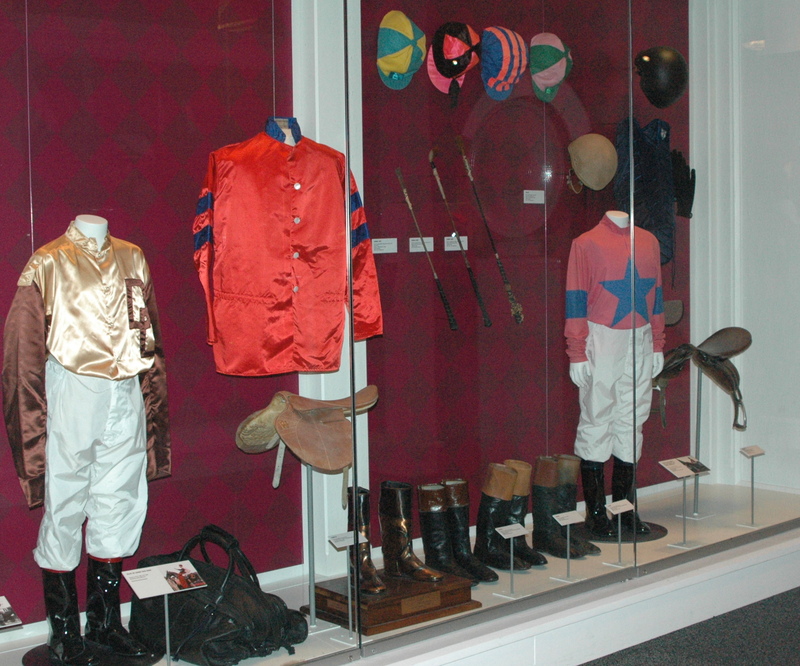 There is a display on the silks that jockeys wear, along with their other equipment they use. The colors represent the horse and the rider. The origins of the silks can be traced back to ancient Rome, when the chariot drivers wore specific colors so the crowds could identify them. 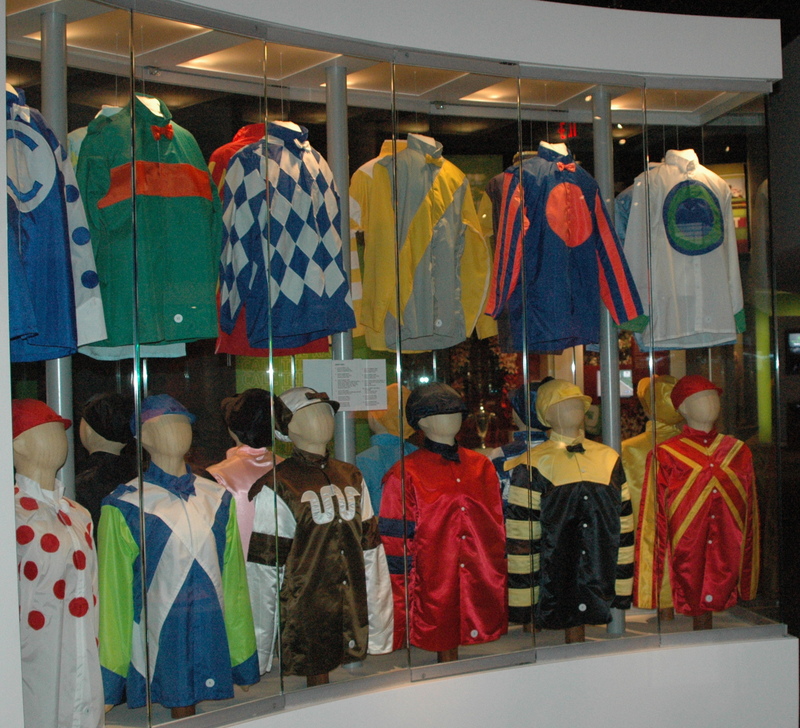 The museum also has a display honoring the current Kentucky Derby winner, showing them in the winners circle. Anyone remember the 2012 winner? 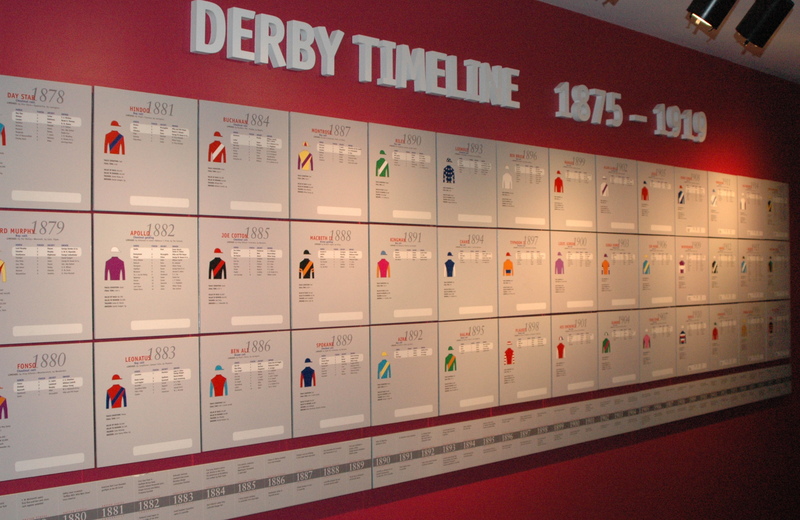 There is a large display listing the winners (and all the horses) of every Derby going back to 1875. 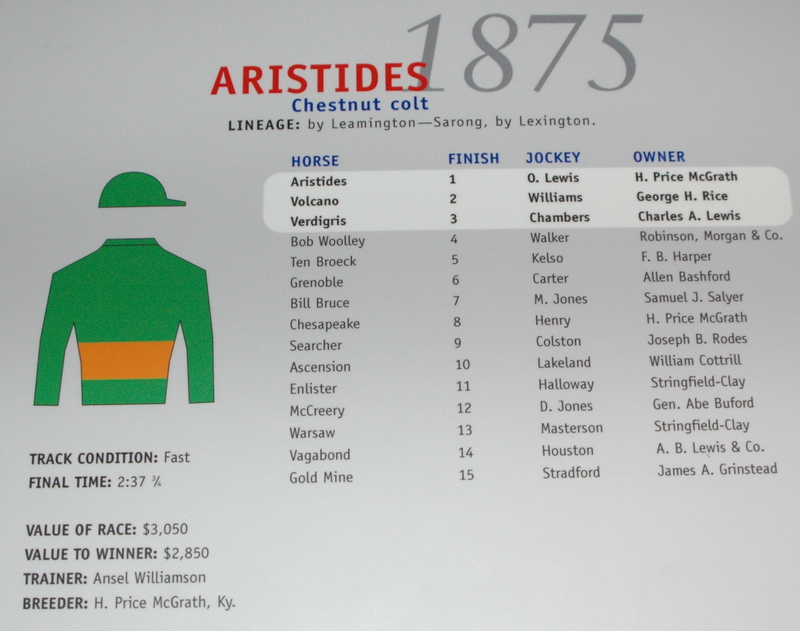 The first winner was Aristides. The winning horse took home $2,850.00! Compare that to this years winner, American Pharaoh, which took home $1,240,000.00. 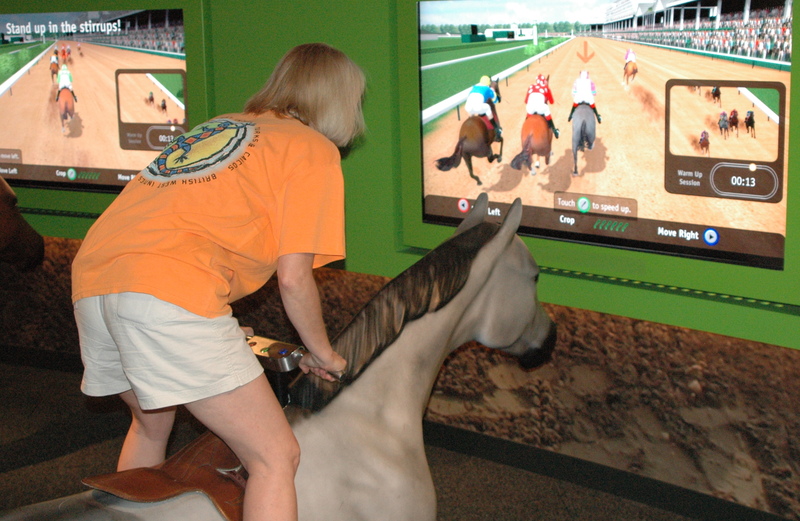 And what would a visit to the museum be without trying my luck at racing? They have a fun racing simulator that you can try out. I had a lot of fun with this! If you are ever in the Louisville area, this is a ‘must do’, in our opinion. We had a great day visiting Churchill Downs and the Museum. Week three at Amazon is in the books. We have again signed up for voluntary overtime on Tuesday. As such, we have not been doing too much on our off days, besides resting, laundry, grocery shopping and planning out the weeks meals (my crock pot is getting a good workout). The work has been pretty steady, with more Halloween costumes, as well as winter coats, mittens and thermal underwear this week. In talking with some full-time employees, they are anticipating a better “peak season” than last year at this center. When we arrived last year, it was crazy busy and chaotic. We have not seen that yet this year. Last year they started their peak in August, and the employees had mandatory overtime from August through December. It is mostly voluntary overtime at this time. This year they are expecting peak season to start in mid-November. And as of now, they may not need to work the 11 hour shifts like they did last year. Some employees are happy about that, others wanted the overtime (more money). We shall see. Ultimately, the customer drives the business. In June of 2012, a year before we went full-time, we attended the Good Sam’s Rally in Louisville, Kentucky. We were able to look at hundreds of RV’s, attend seminars, and talk with many full-time RVer’s. Many of them made the same comment: if I could do it all over again, I would have started sooner. 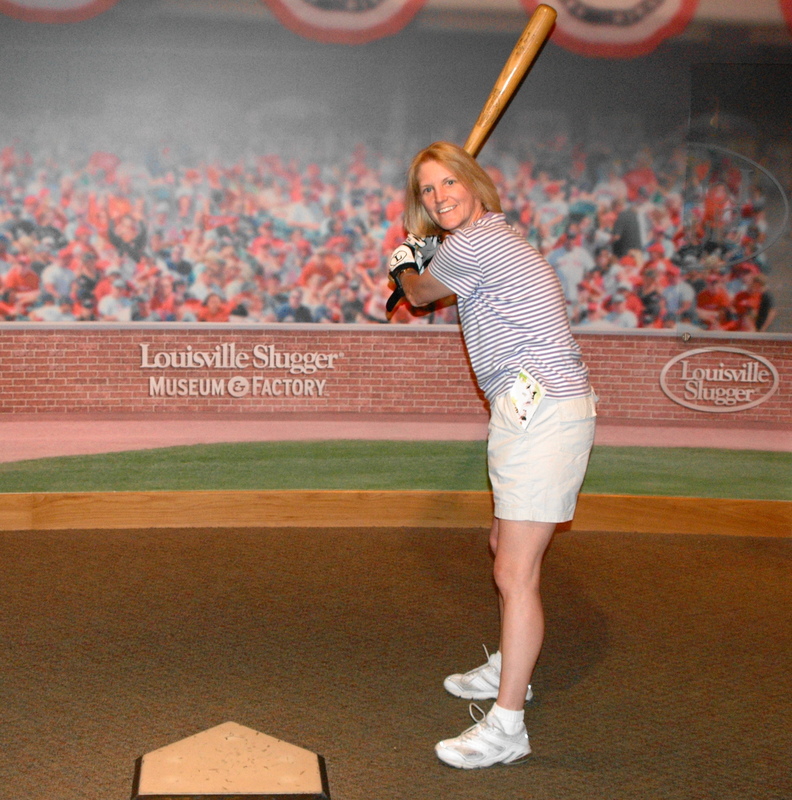 During the seminar, we took some time to explore the Louisville area, including a visit to the Louisville Slugger Museum, right in downtown Louisville. The museum is part of the factory, where they still make over 8,000 different models of bats for both professional and amateur players. 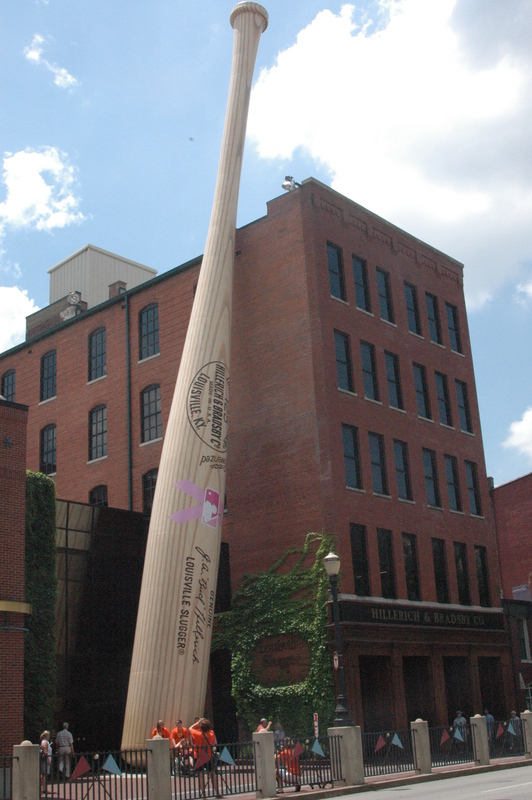 The museum and factory have a distinctive 120 foot tall bat located outside. It is made of steel, and painted to look like wood. 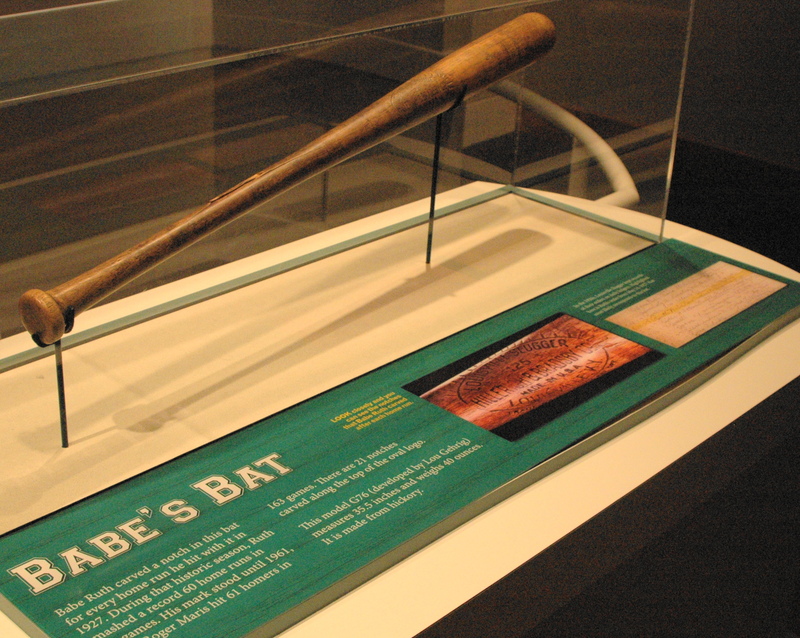 It is a replica of Babe Ruth’s bat. The museum has on display bats from many players, including this Babe Ruth bat from 1927, the year that Ruth hit 60 home runs. They do allow you to hold several bats used from several hall of fame players (after you put on some protective batting gloves). 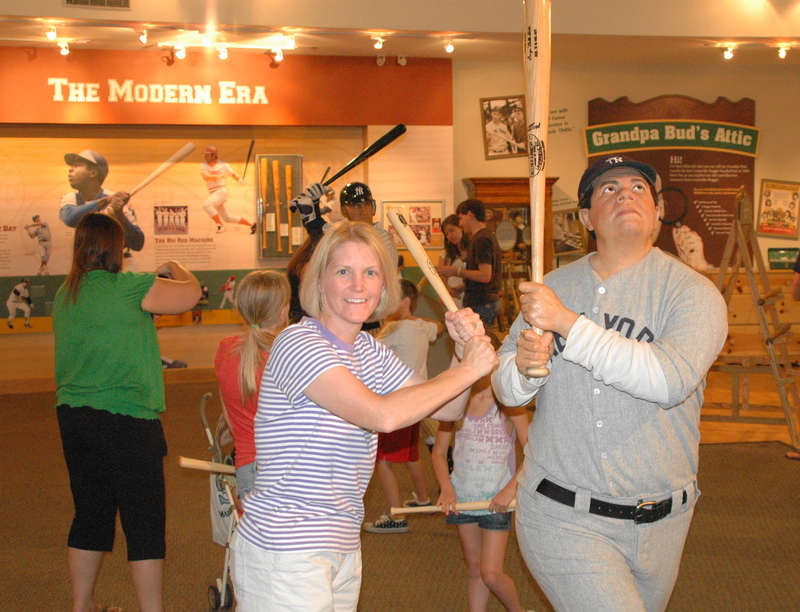 I was able to take a few practice swings with a bat used by Mickey Mantle. They have a tribute to the women who played in the All-American Girls Professional Baseball League (remember that Tom Hanks/Madonna movie?). We toured the factory (no photos allowed inside) and watched several bats being produced. They used to hand carve the bats using a lathe, but now can produce several bats in just minutes on a machine. 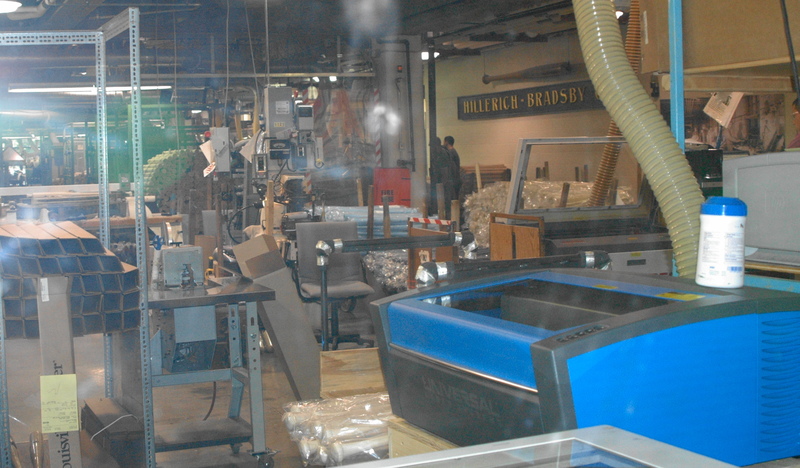 In the museum, there is one window that looks into the factory. The blue machine is what is used today to manufacture bats. 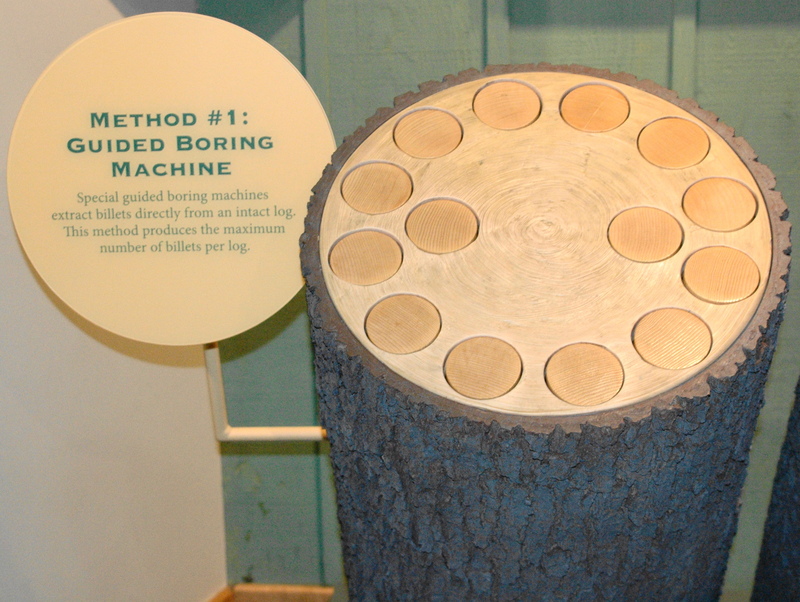 They have a boring machine that is used to extract billets from a log. The billets are then placed into the machine and carved into the bats. It’s a very interesting tour, and everyone receives a souvenir mini bat when you leave. We decided to jump right into the swing of things, and picked up voluntary overtime this week. Going from 4 five-hour days right into 5 ten-hour days was a little tough on the feet! But our goal this year at Amazon is “fatter wallet, slimmer waist”!! And the 50 hour weeks will help us achieve that goal in no time. There are two main picking areas at the Jeffersonville center: East and West. Last year we were both on the West side the entire time, until our very last day when I “moved on up” to the East side. I happily discovered it was the easier side to pick, since the majority of the pickers, stowers and ICQA employees were assigned to the West side. The two sides are identical, except for the fourth floor. The West side contains the HRV floor (high retail value), consisting of watches and jewelry. The East side just has more clothing on the fourth floor. This week, they moved all the Camperforce employees to the East side, and stated we will remain there the rest of the season. It is closer to our lockers and the seasonal break room, so it made sense to move all of us there. Those of us that picked on the West side last year are thrilled to be on the “easier” and less crowded side of the building. Also new this week, Amazon removed the metal detectors at the entrances, and replaced them with RFID panels. I am not sure how this technology works, but we no longer have to remove items from our pockets (keys, coins, etc). You just simply walk between the panels on the way out. It used to take several minutes (or more during peak) to go through the metal detectors. Now it takes no additional time at all. You still need to stop at a table if you are carrying a lunch bag or purse, but it is a huge time saver. They post a weekly newsletter on the back of the bathroom stalls (Dan says they are also posted above the urinals), and this past week they hired an additional 200 employees as they start ramping up for peak season. Although this is not a job I would want to do year round, Amazon does offer some nice benefits for their employees, including fully paid health insurance and stock options. Mandatory overtime has been called for the upcoming week. Amazon has opened up their Halloween “store” and are having a sale. They are expecting a very large volume of orders this week. Camperforce is required to do the mandatory overtime, up to 50 hours. We are happy to have the hours. And we both enjoy picking Halloween costumes. They are easy to pick, as they stand out in a drawer of socks, shirts, jeans, jackets and underwear. It is also fun to see what people are planning to dress up as. Some of you are going to be very “naughty” this Halloween, as we have seen a lot of very “adult” costumes! In fact, we are picking about five times more adult Halloween costumes compared to the kids. Tonight we are having another get together with our fellow Camperforce employees. The best part of Amazon is the social side. You sure do meet a lot of great people! Tomorrow (Tuesday) is our overtime day, and then back to our Wednesday through Saturday schedule. Wednesday is “pink out” day, to show support for breast cancer research. Looking forward to another “fun” week! Work….eat….sleep….repeat! This will be our life for 10 more weeks! We have finished up our first week as Pickers at the Amazon Fulfillment Center in Jeffersonville, Indiana. This is our 3rd year as part of the Camperforce team with Amazon. After 2 years at the Campbellsville, Kentucky center, we decided to work in Indiana this year. Last November, we were a part of 98 Camperforce employees that transferred to Jeffersonville, to help out with their peak season (from Thanksgiving to Christmas). We enjoyed our time there, so when they decided to add this location as part of their Camperforce location, we applied here. You can read about last years events here. This year Amazon again offered four locations for their Camperforce program. That is what they call their work campers that they hire. Campbellsville and Murfeesboro, TN were the returning centers. New this year is Jeffersonville, and Haslet, TX. We briefly considered going to the Texas location, but then we found out that facility uses the robots. With the robots, you stand in one area, and the robot brings the pod containing the merchandise to you. Then you pick the item you need, and the next bin is brought to you. We did not want a stationary job, so we ruled out going to Texas. We enjoy the freedom you have with picking, along with all the exercise. We often refer to Amazon as our 12 week fitness plan. They are paying us to exercise! Amazon has standardized their pay for Camperforce. It is $10.75/hour at all facilities. You can earn $1.00/hour completion bonus for every hour that you work, if you make it to your release date (no later than 12/23). In addition, Amazon pays for your full hook-up campsite, including electricity. The campsites vary as far as amenities. Amazon has four 10 hour days, and there will be both voluntary and mandatory overtime, which is paid at time and a half. The mandatory overtime usually comes in November and December. Another reason we choose Jeffersonville, is the possibility of a lot of overtime, due to the tremendous growth in the apparel business. I have previously written about the various jobs, so I won’t go into too much detail. If you are interested in learning more about Amazon, type in the word Amazon in the search box on our website, and it should bring up all the prior posts that I have done. Amazon has two basic types of jobs: mobile and stationary. The mobile jobs are Picking (using a hand-held scanner to identify the location and product, you pick the item and place it in a tote). Stowing is also a mobile job, and you take a cart full of merchandise and place it on the shelves. The stationary jobs are Receiving (unloading trucks) and Packing (putting the merchandise in boxes for shipping). Jeffersonville specializes in apparel, shoes, jewelry and watches. Apparel is the fastest growing segment of Amazon’s business. This center was opened in 2012, and the business continues to grow. They are expecting orders to be up 30% over last year. We have noticed there is more merchandise already than last December when we arrived. We wanted to work here this year, because Picking is easier than Campbellsville. You do not get bumped around to different buildings and different floors. The place is so big, that you can work on one floor most of the day. And clothing is easier to pick than some of the big, bulky heavy items that Campbellsville currently carries. Campbellsville is in the process of remodeling over the next several years, and will eventually be mostly apparel as well. Our first week consisted of one eight-hour day with orientation, paperwork and safety school. The next four days were only 5 hours, and involved working in the picking department. They refer to this as “work hardening”, and it really helps us get used to all the walking. This year Amazon is allowing employees to wear Fitbit’s and other wearable exercise tracking devices. So I will be keeping track of my steps again this year. Week two consists of the four 10 hour days. We were happy when they announced voluntary overtime, and we signed up for it. Camperforce employees are only required to do overtime when it is mandatory, so only a handful of us signed up this week. Nothing like going right into 50 hour work weeks! 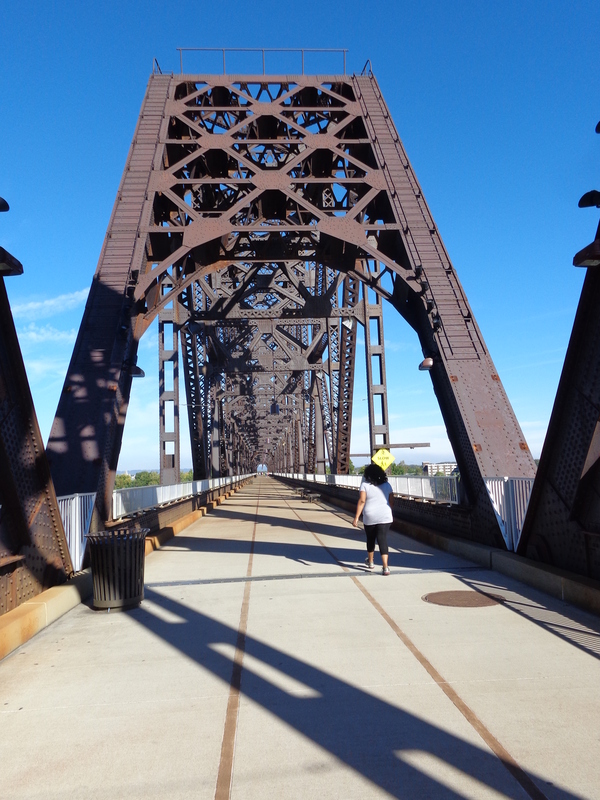 On our two days off, after running a lot of errands, we did go down to the riverfront and walk over from Indiana to Louisville, KY on the Big Four Bridge. 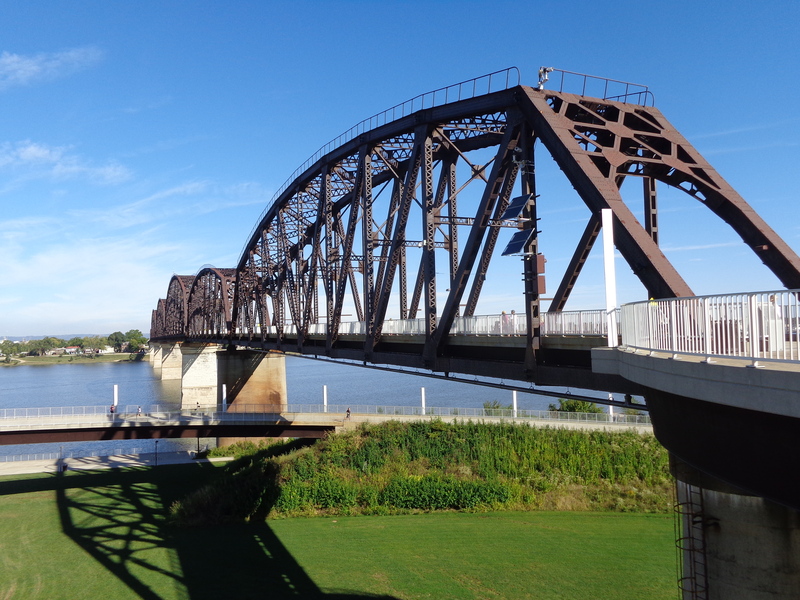 Originally, this was built as a railroad bridge across the Ohio river, it was abandoned in 1969, and was redone into a pedestrian/bicycle bridge in 2013. In addition, we got together with several of our fellow Camperforce workers for a nice dinner at Boombozz pizza in Jeffersonville. You don’t have much time for socializing at work, so it was nice to get together with our fellow workers. We are going to try to do a weekly get together, as we are all working the same shift in Jeffersonville.